Entrepreneurs who are planning to incorporate at the end of the year are usually focused on being in a position to operate at the beginning of the New Year. Rather than form the new business on the first business day of the year (January 4, 2016), California entrepreneurs can file their Articles before year end, so long as they do not actually do business in 2015. California Rev & Tax Code Section 23114 gives entrepreneurs a head start on their business plans for the new year by enabling them to file their Articles before year end without being obligated to file a tax return for the current tax year. To satisfy the rule, a new corporation must meet both of the following requirements: (1) the tax year is 15 days or less; and (2) the corporation did no business during the 15 days. The date stamped on the Articles of Incorporation by the California Secretary of State (SOS) is the date that determines when the corporation is formed for purposes of the rule. The California SOS passes this date to the FTB to use as a the corporation’s date of incorporation. 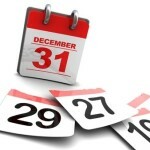 In our firm, to avoid confusion, we will file “year-end” Articles on December 18, 2015. Between now and year end, entrepreneurs who are forming corporations that might not actually commence business until 2016 are well served to consider whether a little patience can save a few bucks. Instead of filing the Articles now, unless the business requires it, preparing all of the documents and holding off on the actual filing until December 18, 2015, can result in considerable savings.